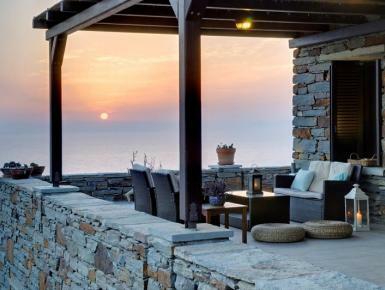 The Kastellakia Bay Villas are three individual, traditional, stone-built, luxury, Cycladic homes on the unadulterated, up-and-coming island of Kea (Tzia), in the middle of the famous Greek Aegean Archipelago of islands, but still close to Athens and Greeces mainland. The villages of Peeses and Koundouros are close (1-2 km), offering amenities like shopping or dining. The Villas, apart from a uniquely beautiful location boast a single feature which makes them first choice for many guests, couples or families: a 60 meter long secluded beach with crystal-clear transparent aqua-blue waters, right at the edge of the property. To make it even better, except for Villa guests, few have access to it!